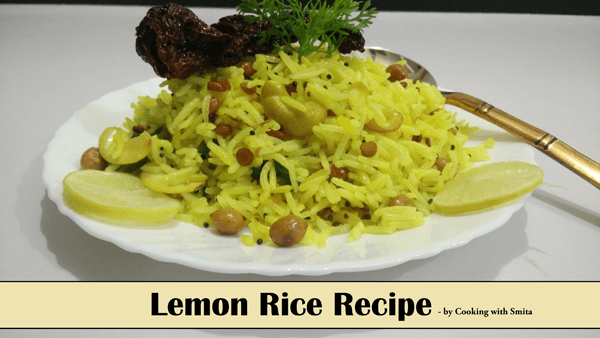 Lemon Rice is very popular South Indian dish and is simple and easy to make. It is a good option for lunch or dinner on those days when you don’t feel like spending much time in the kitchen. It is usually eaten alone or with yogurt, raita, chutney or kosambari (salad made from pulses). Heat the Oil in a Pan Add Dry Red Chillies, Split Bengal Gram (Chana Dal) and Split White Lentils (Urad Dal), sauté till lentils turn slightly Golden Brown in colour. Add Mustard Seeds and allow to crackle. Add Curry Leaves, Green Chillies and Ginger, sauté for approx 30 seconds. Add Asafoetida and Peanuts and sauté for 1 minute. Add Cashews and sauté for another 30 seconds or till Cashews turn Golden Brown in colour. Lower the flame and add cooked Rice, Lemon Juice, Salt and Sugar. Mix well all ingredients. Switch Off Gas and Serve Hot Lemon Rice with Papad, Yogurt, Raita, Coconut Chutney or Kosambari.